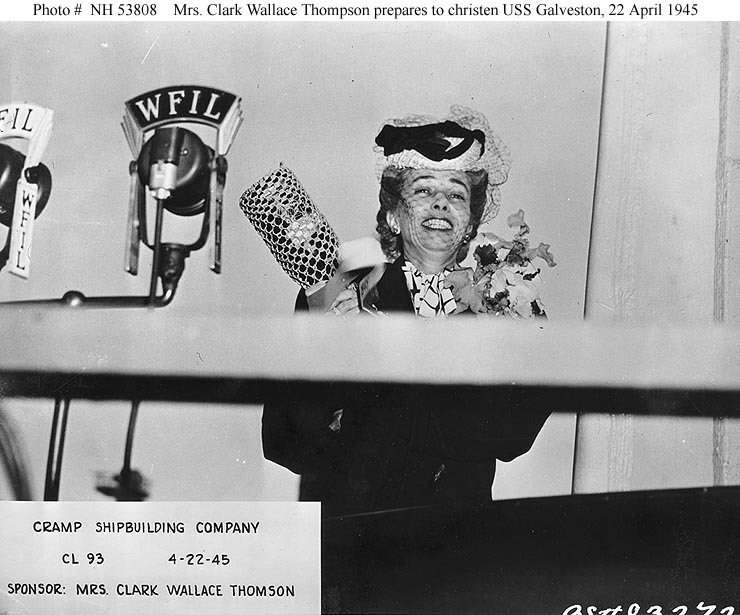 USS Galveston (CL 93) Ship's Sponsor, Mrs. Clark Wallace Thompson, prepares for the christening, at the Cramp shipyard, Philadelphia, Pennsylvania, 22 April 1945. 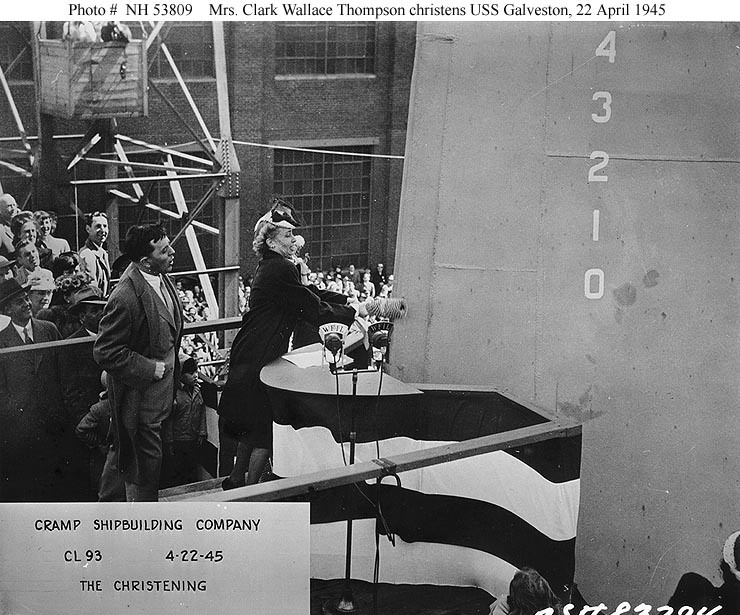 USS Galveston (CL 93) Mrs. Clark Wallace Thompson christens the ship, during launching ceremonies at the Cramp shipyard, Philadelphia, Pennsylvania, 22 April 1945. 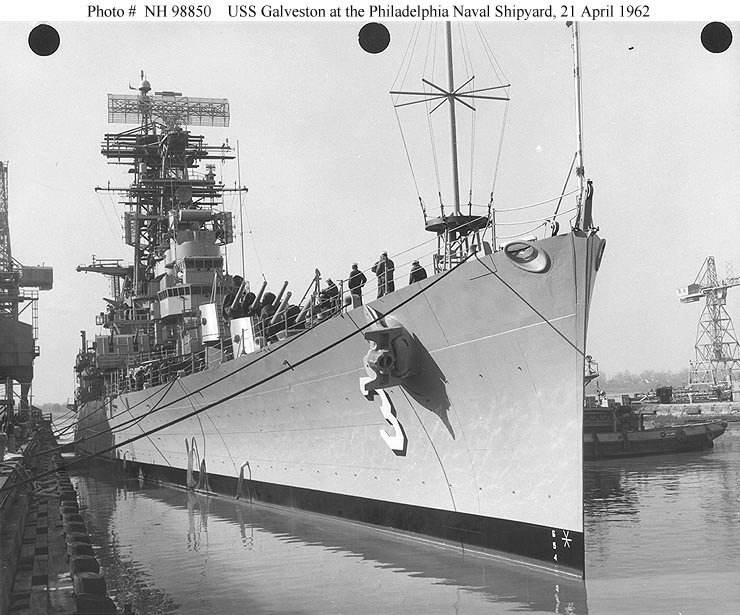 USS Galveston (CL 93) going down the ways on 22 April 1945. 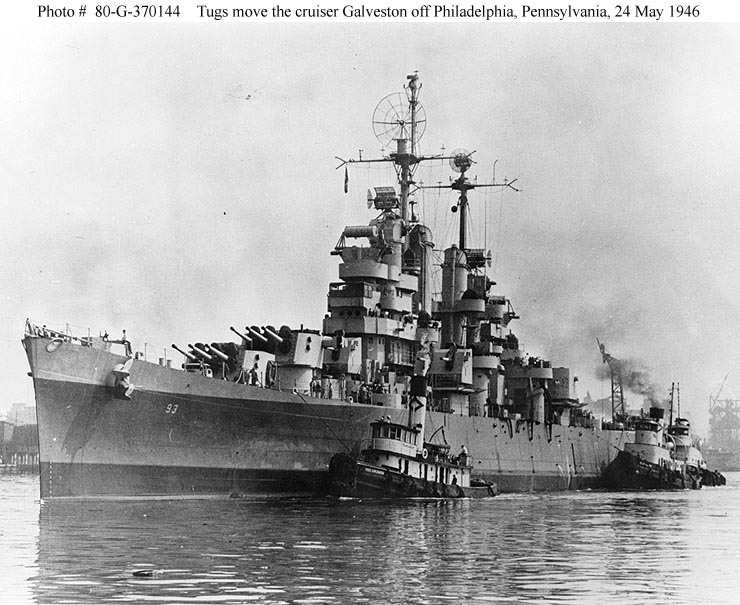 USS Galveston (CL 93) Is tugged from the Cramp shipyard, Philadelphia, Pennsylvania, to the Philadelphia Navy Yard, 24 May 1946. 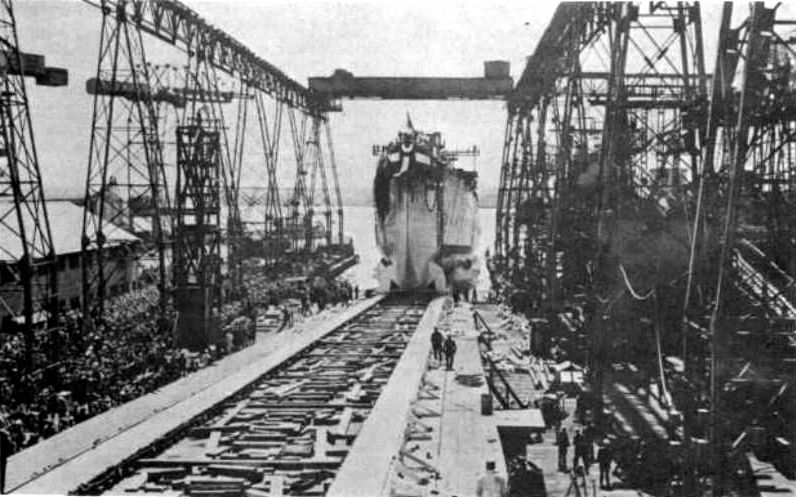 The ship was laid up, not quite complete, in the Atlantic Reserve Fleet, shortly afterwards. 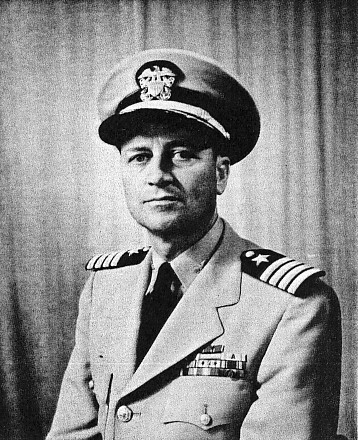 Official U.S. Navy Photograph, now in the collections of the National Archives 80-G-370144. U.S. 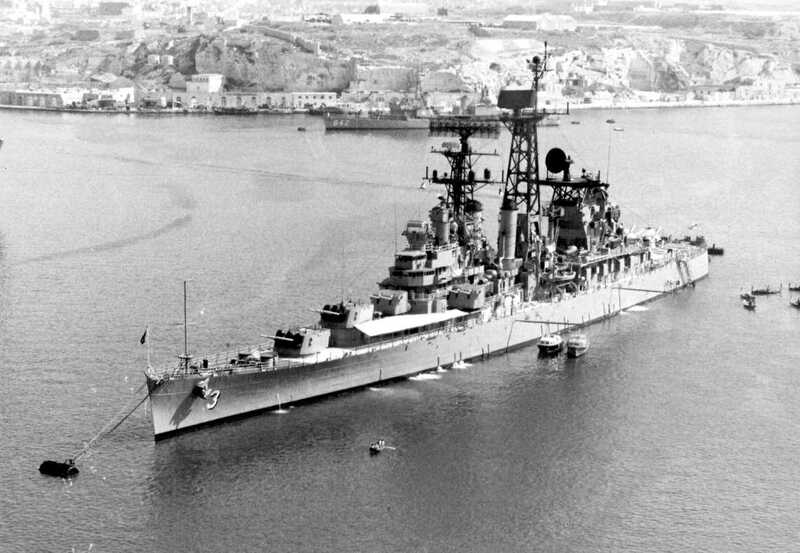 Naval Historical Center Photograph. #NH 53807. 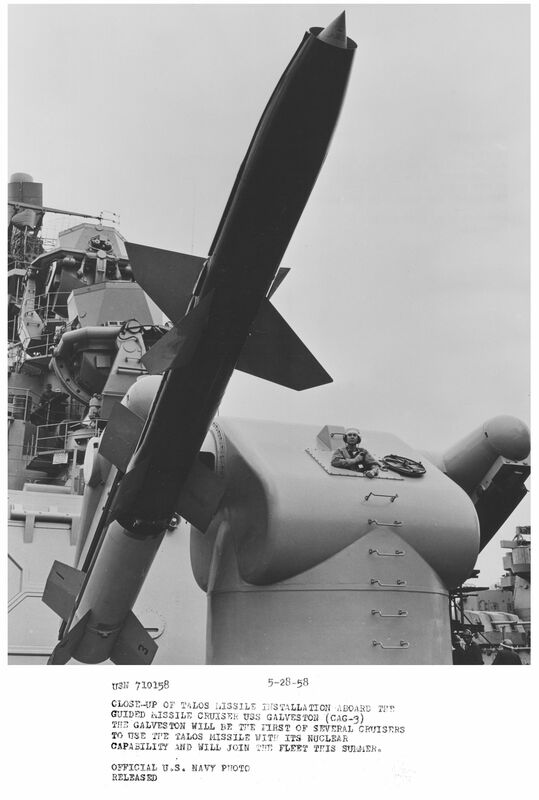 04010346 613k Photo caption: USN 710158 5-28-58 Close-up of Talos missile installation aboard the guided missile cruiser USS Galveston (CAG-3). 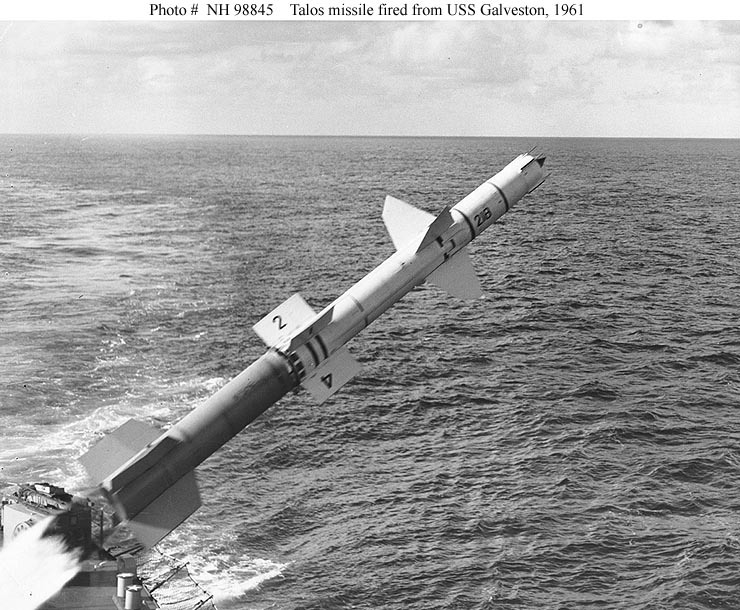 The Galveston will be the first of several cruisers to use the Talos missile with its Nuclear capability and will join the fleet this summer. 04010347 1.4m The business end of a Talos missile. 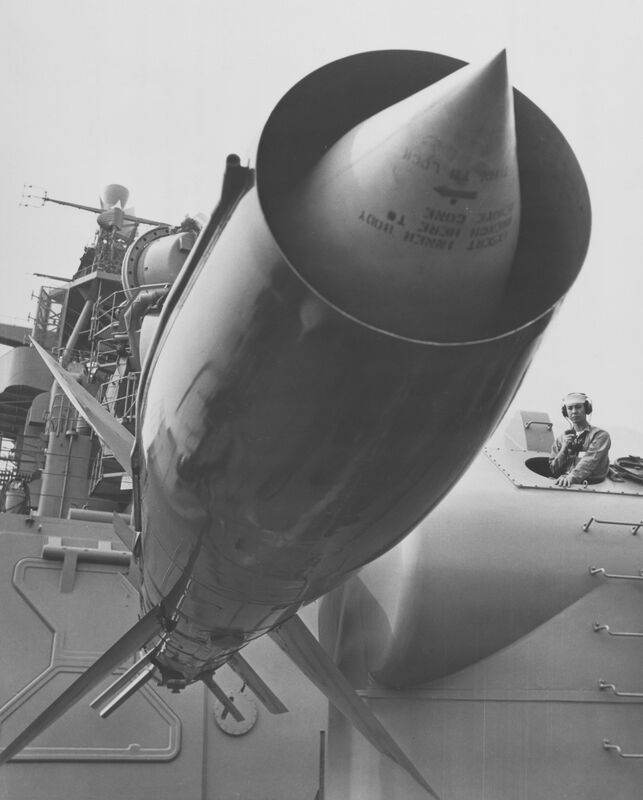 The center portion is the actual warhead, an integral part of the Ramjet engine which was the propulsion for the missile. 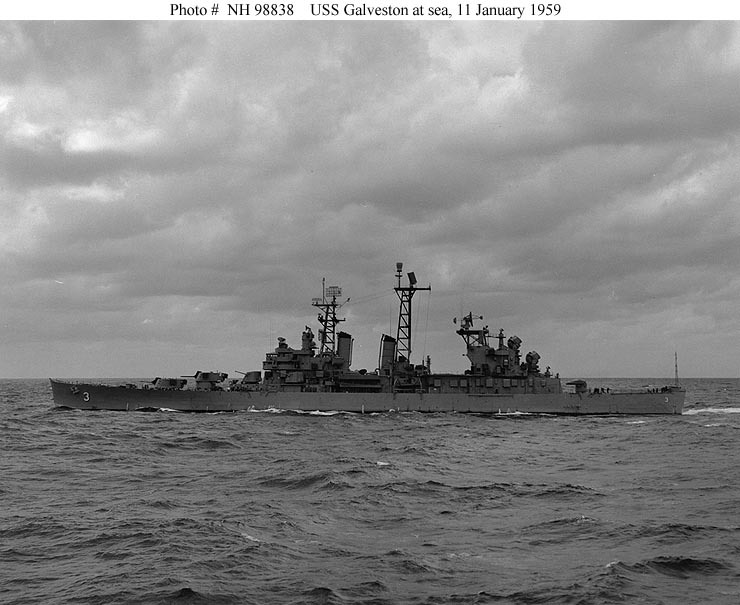 USS Galveston (CLG 3) Underway at sea, 11 January 1959. Official U.S. Navy Photograph, from the collections of the Naval Historical Center #NH 98838. 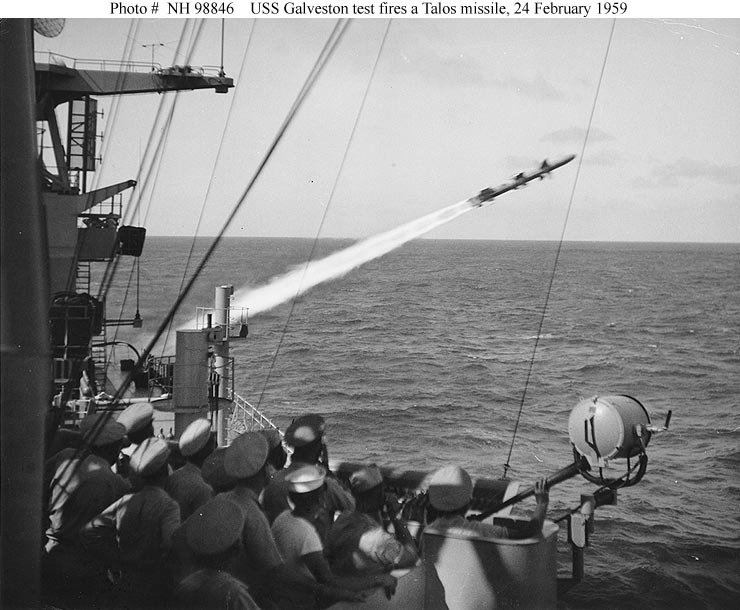 USS Galveston (CLG 3) Launches a "Talos" guided missile on 24 February 1959, the first time the "Talos" was fired at sea. 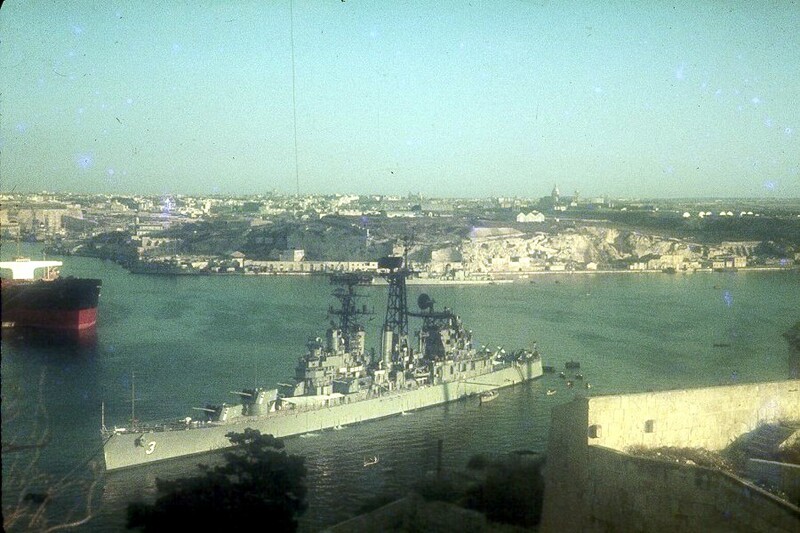 This photograph was released by the Department of Defense on 12 March 1959. 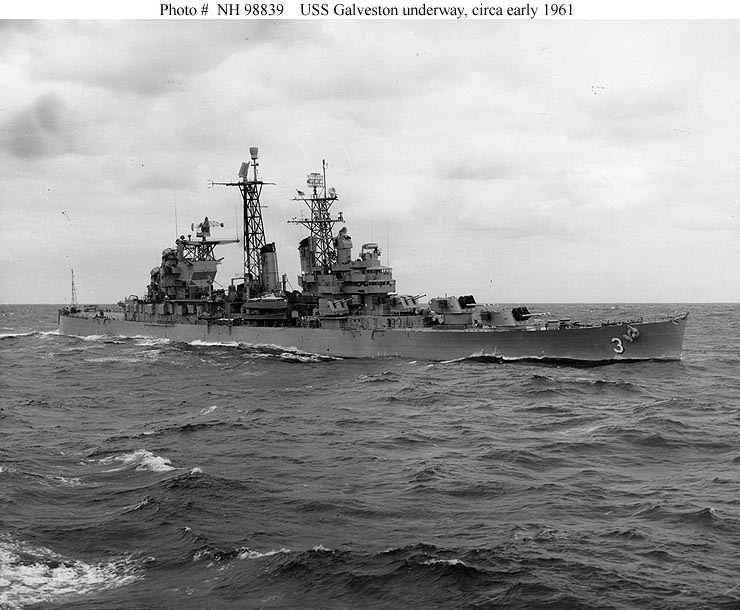 Official U.S. Navy Photograph, from the collections of the Naval Historical Center #NH 98846. 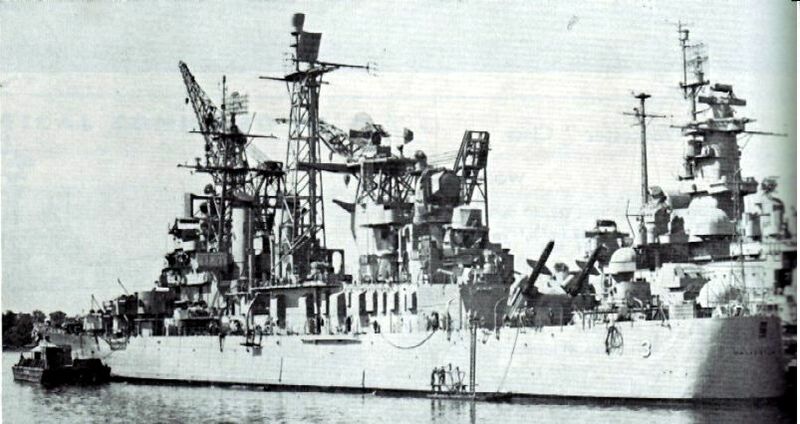 USS Galveston (CLG 3) At sea, circa 1958-1961, while fitted with her original suite of radar antennas. 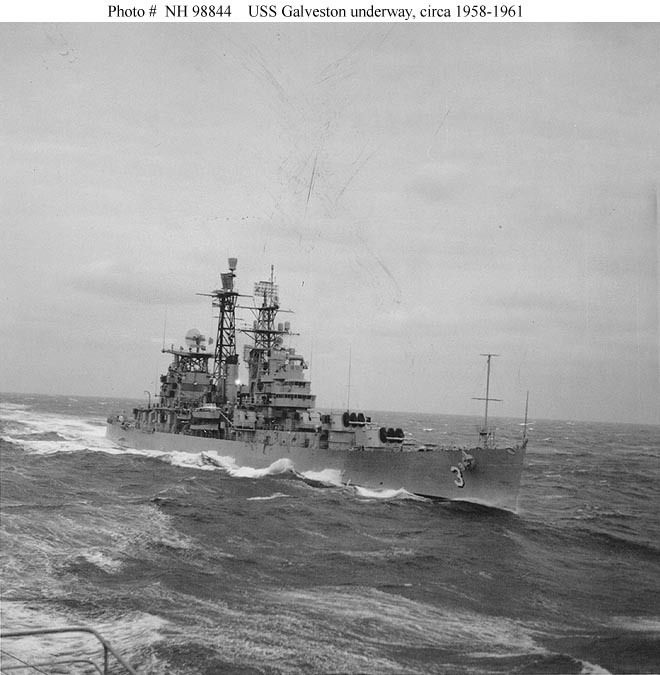 Official U.S. Navy Photograph, from the collections of the Naval Historical Center #NH 98844. 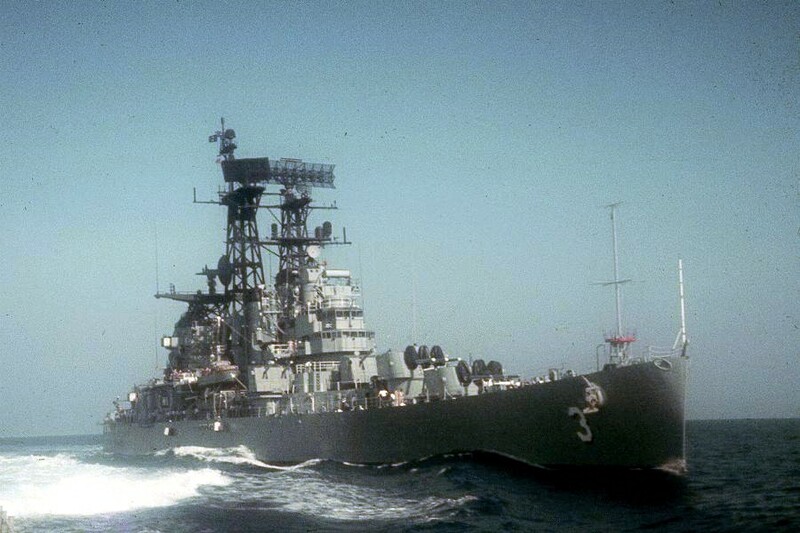 USS Galveston (CLG 3) Underway at sea, circa early 1961. 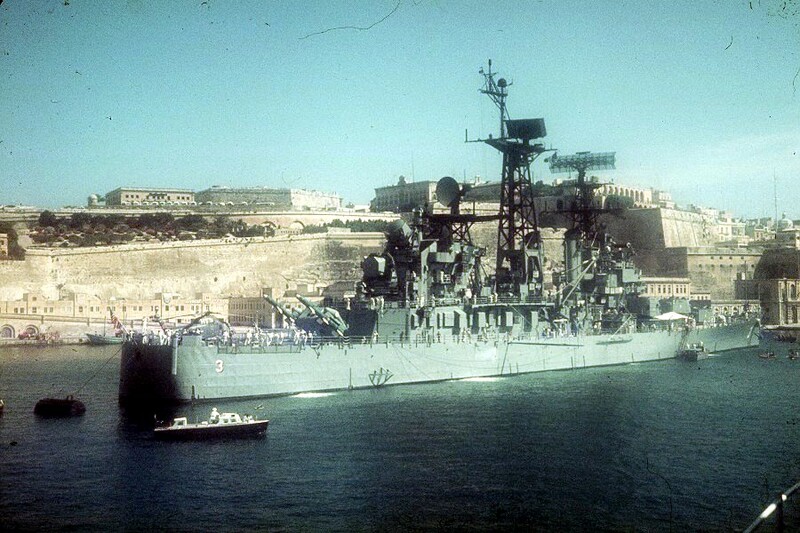 This photograph was an enclosure to a letter sent by the ship on 9 March 1961. 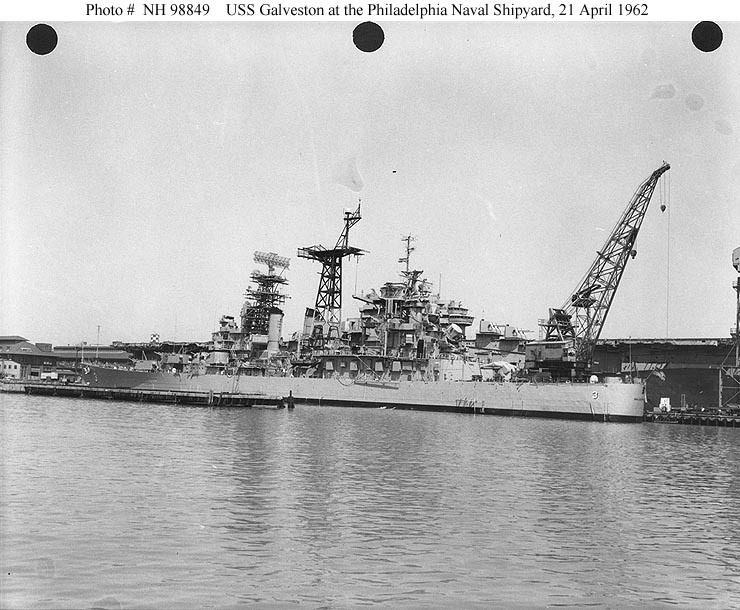 Official U.S. Navy Photograph, from the collections of the Naval Historical Center #NH 98839. 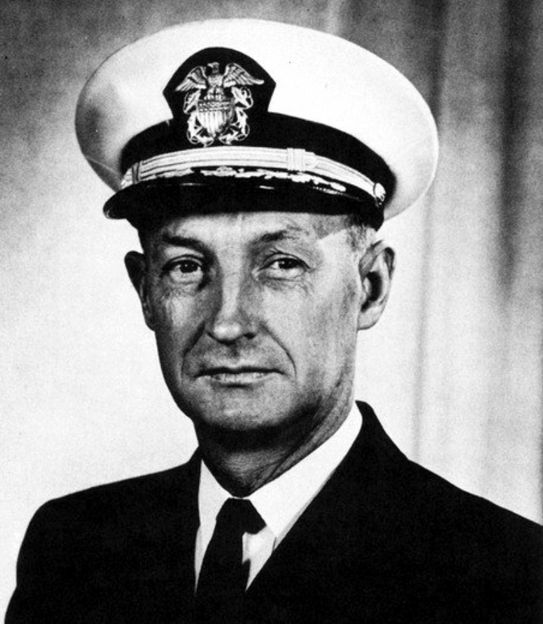 Official U.S. Navy Photograph, from the collections of the Naval Historical Center #NH 98845. 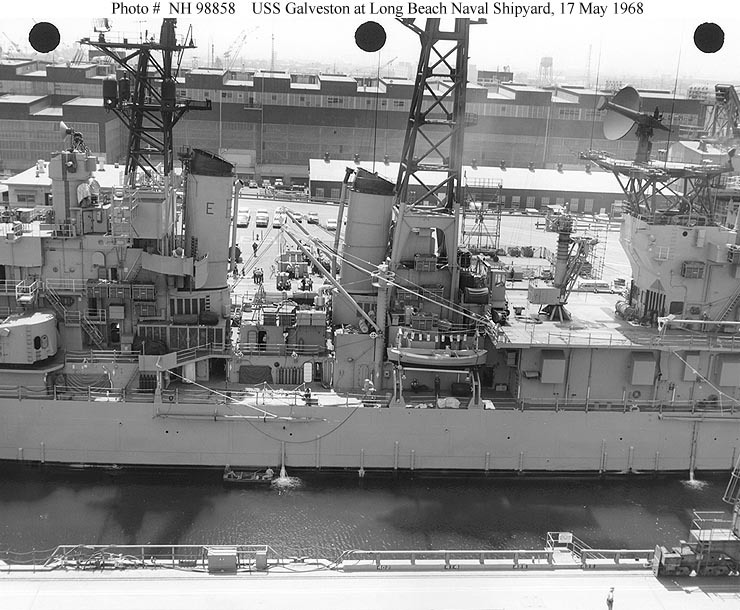 USS Galveston (CLG 3) At the Philadelphia Naval Shipyard, 21 April 1962, probably while undergoing an inclining experiment. 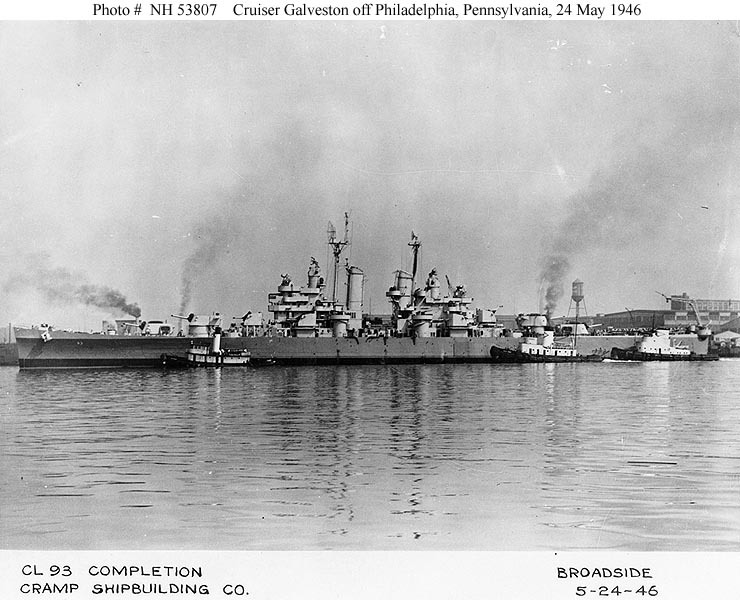 Official U.S. Navy Photograph, from the collections of the Naval Historical Center #NH 98849. 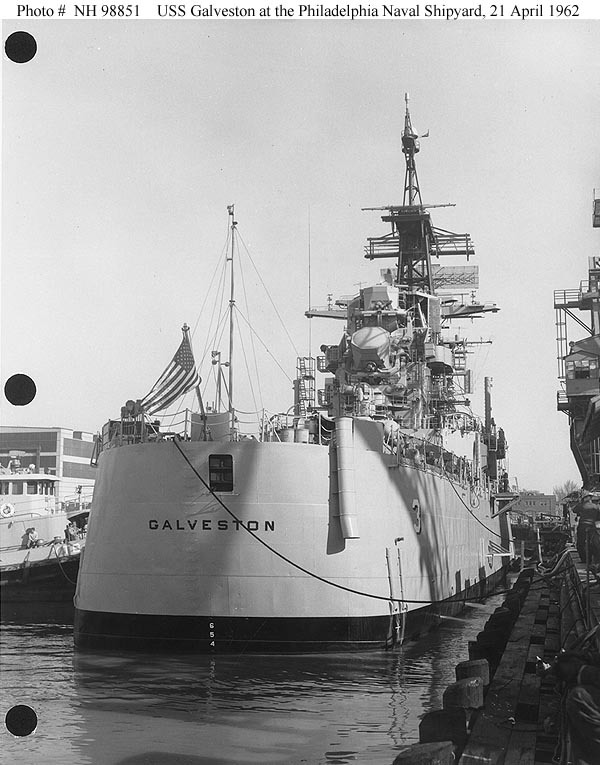 USS Galveston (CLG 3) At the Philadelphia Naval Shipyard, Pennsylvania, 21 April 1962, probably while undergoing an inclining experiment. 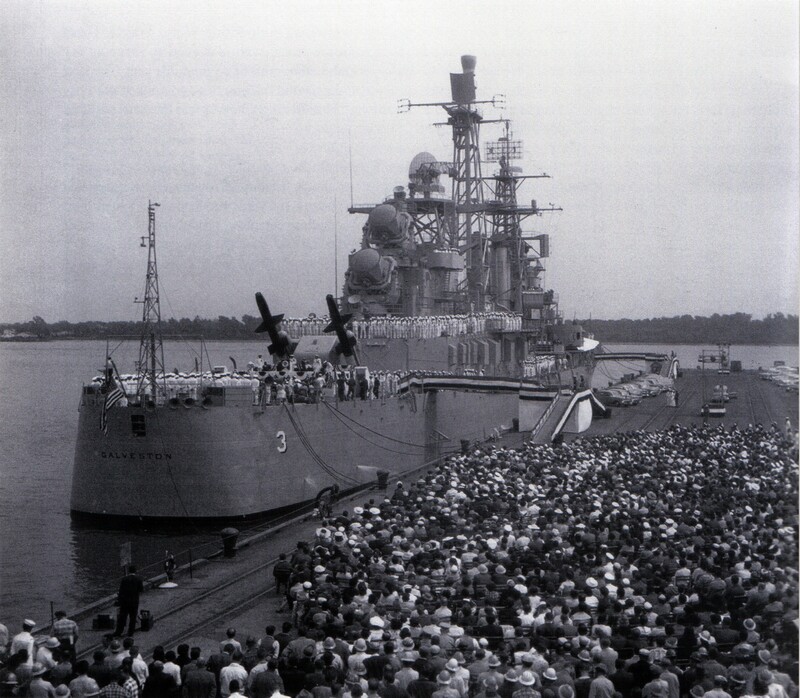 Official U.S. Navy Photograph, from the collections of the Naval Historical Center #NH 98850. Official U.S. Navy Photograph, from the collections of the Naval Historical Center #NH 98851. 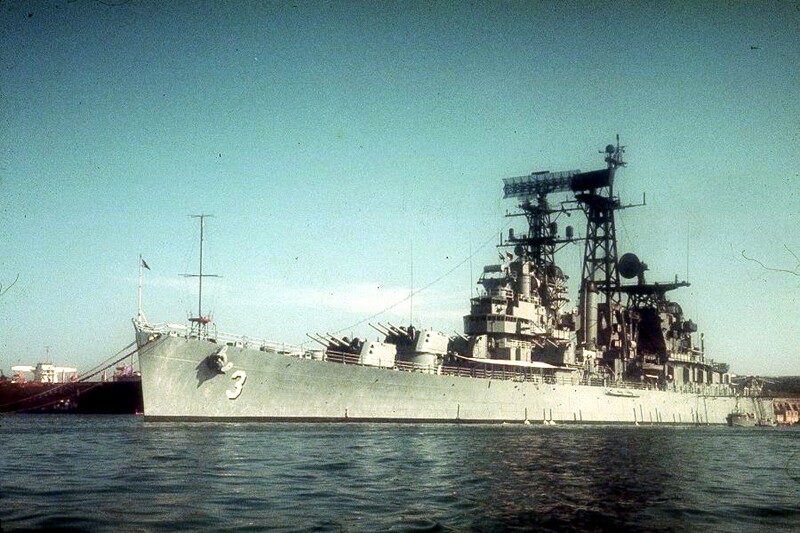 At anchor in 1963, location unknown. 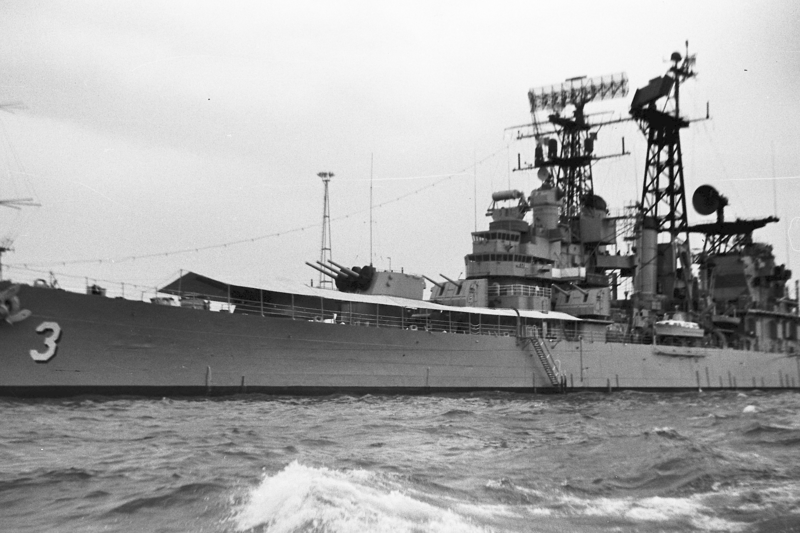 USS Galveston (CLG 3) At sea in October 1963. Photographed by PH1 R.M. 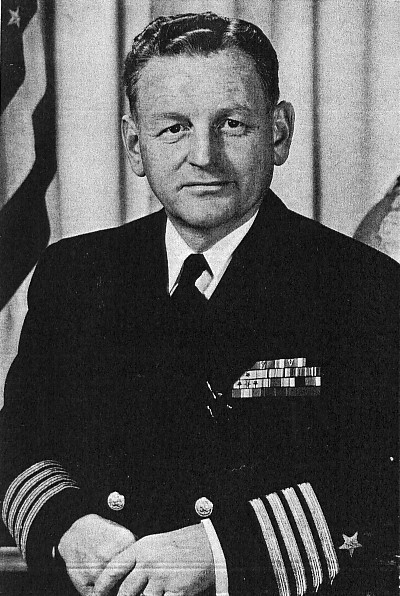 Moen, of USS Kitty Hawk (CVA 63). 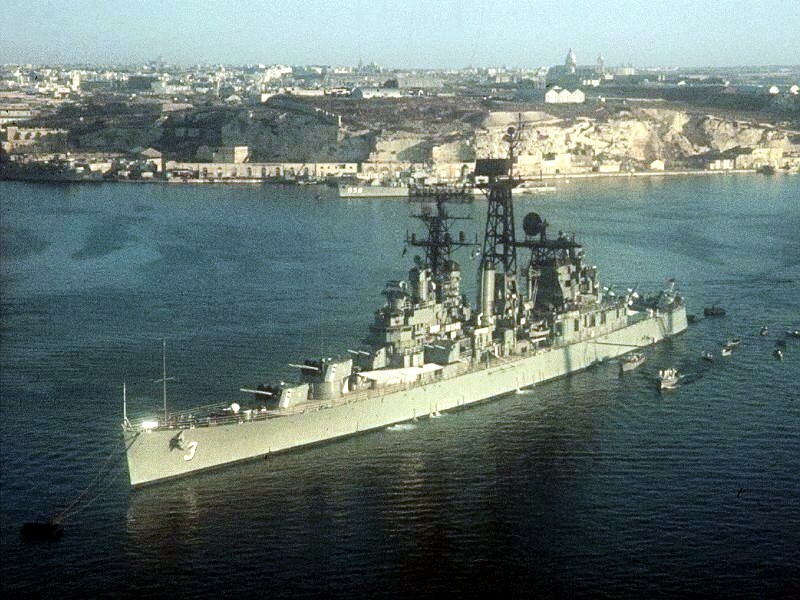 USS Perkins (DD 877) is in the distance. 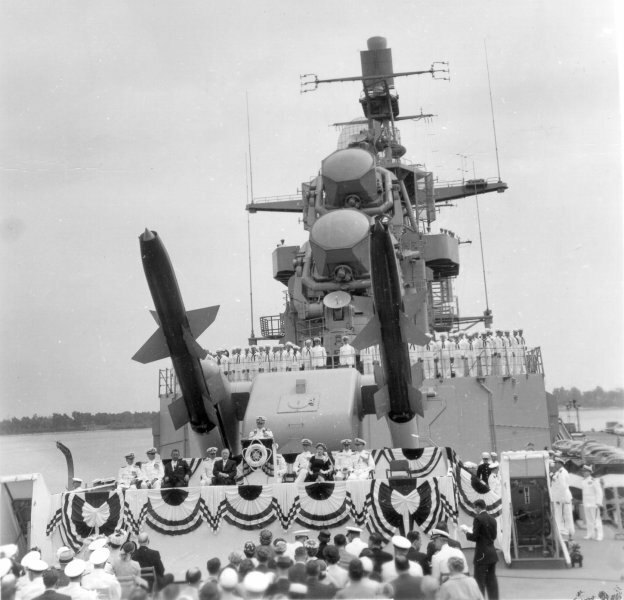 Official U.S. Navy Photograph, from the collections of the Naval Historical Center #NH 98840. 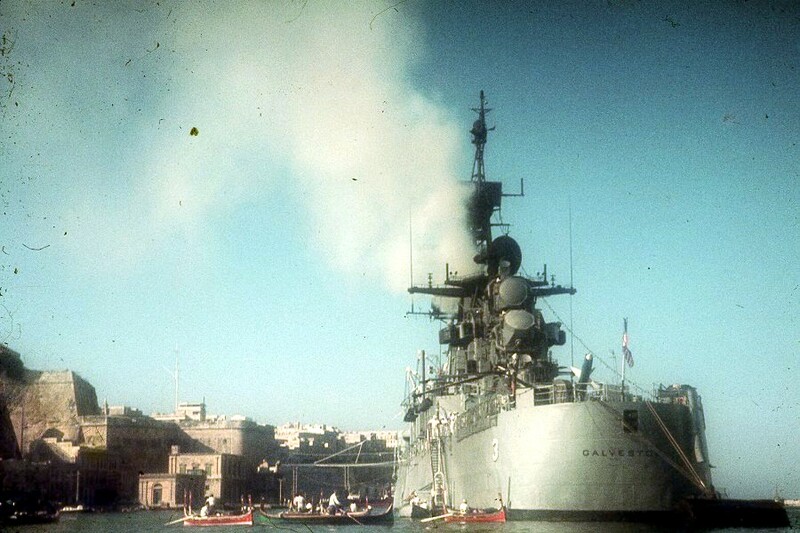 USS Galveston (CLG 3) Steaming at sea, 24 August 1964. 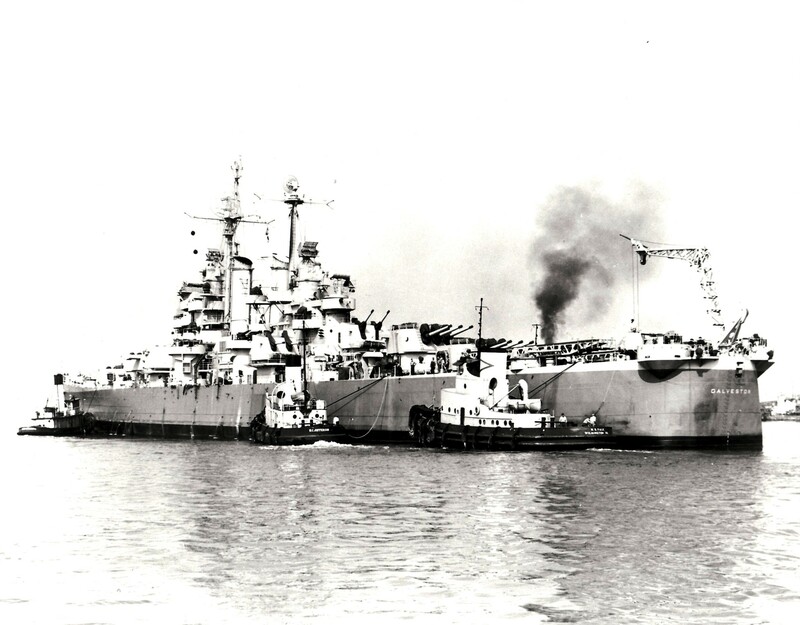 Official U.S. Navy Photograph, from the collections of the Naval Historical Center #NH 98841. Nice port side view while underway, entering San Francisco Bay just after passing beneath the Golden Gate Bridge. Mid 1960's. 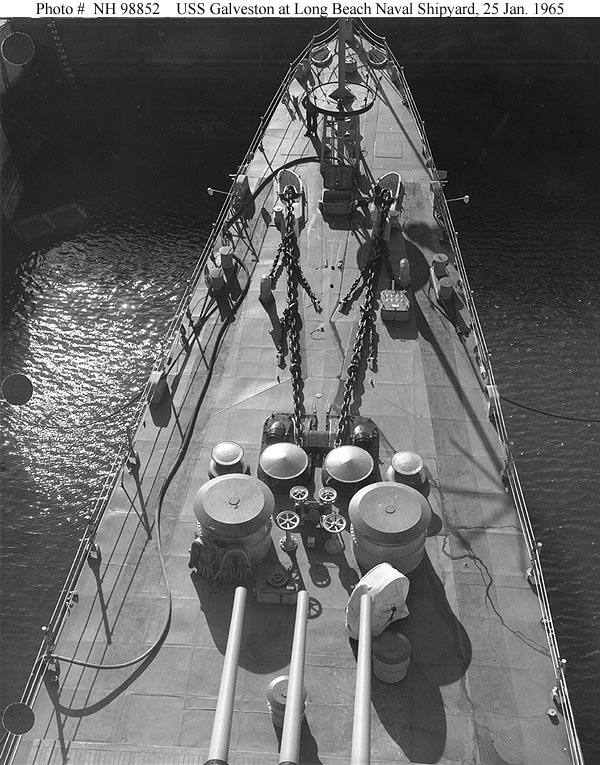 USS Galveston (CLG 3) View of the ship's foredeck, with anchor handling gear, taken while she was undergoing an inclining experiment at the Long Beach Naval Shipyard, California, 25 January 1965. 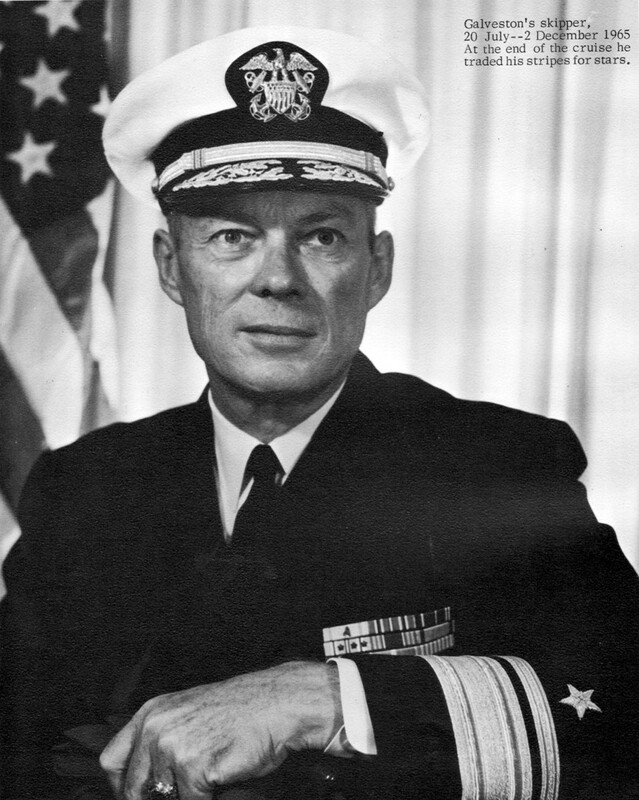 Official U.S. Navy Photograph, from the collections of the Naval Historical Center #NH 98852. 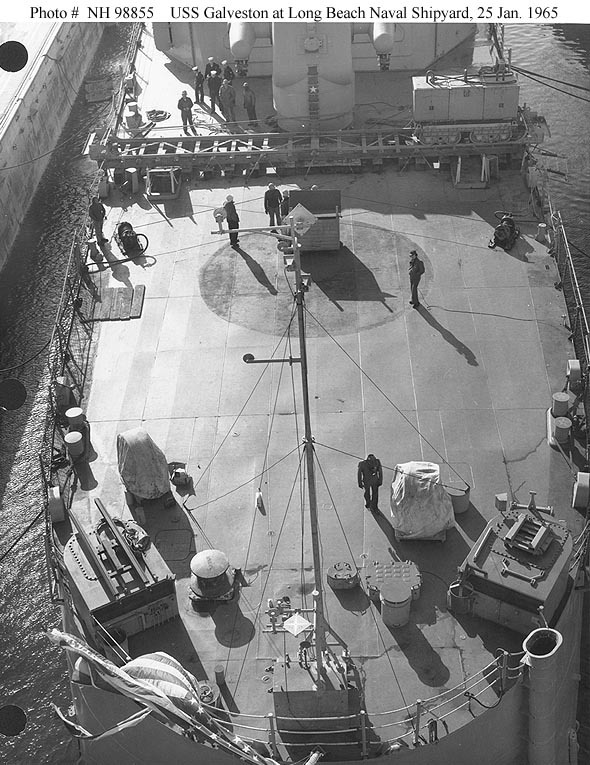 USS Galveston (CLG 3) View of the ship's guided missile guidance radars, taken while she was undergoing an inclining experiment at the Long Beach Naval Shipyard, California, 25 January 1965. 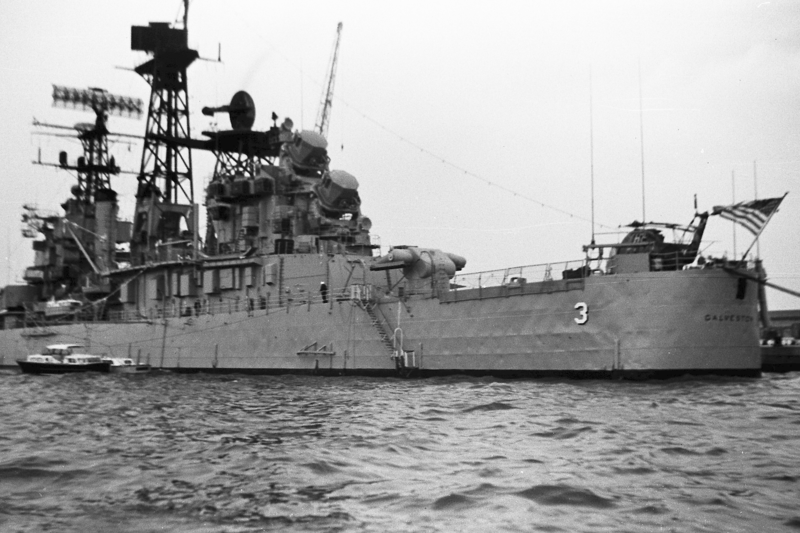 Official U.S. Navy Photograph, from the collections of the Naval Historical Center #NH 98853. 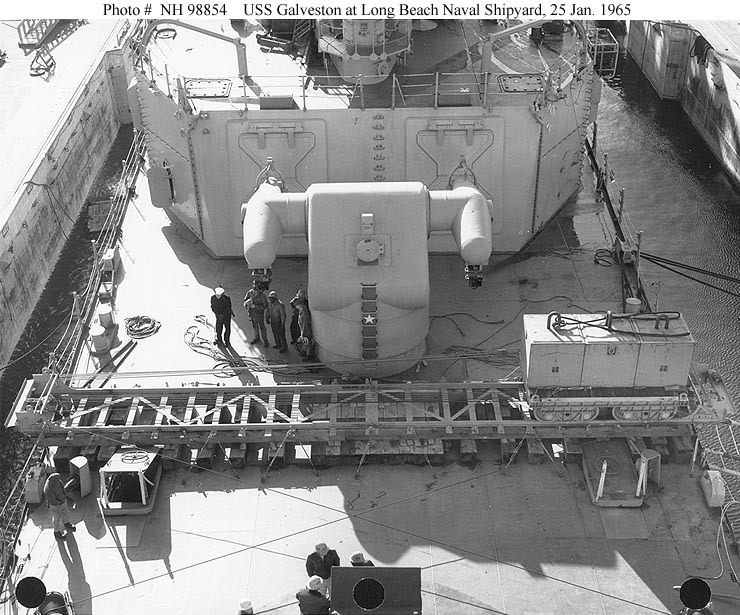 USS Galveston (CLG 3) View of the ship's launcher for "Talos" guided missiles, taken while she was undergoing an inclining experiment at the Long Beach Naval Shipyard, California, 25 January 1965. Athwartship track in the foreground is for shifting weights during the experiment. 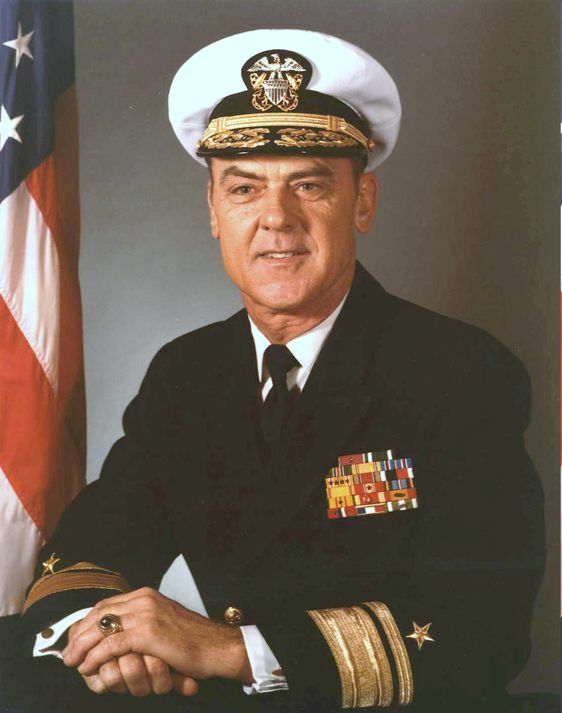 Official U.S. Navy Photograph, from the collections of the Naval Historical Center #NH 98854. 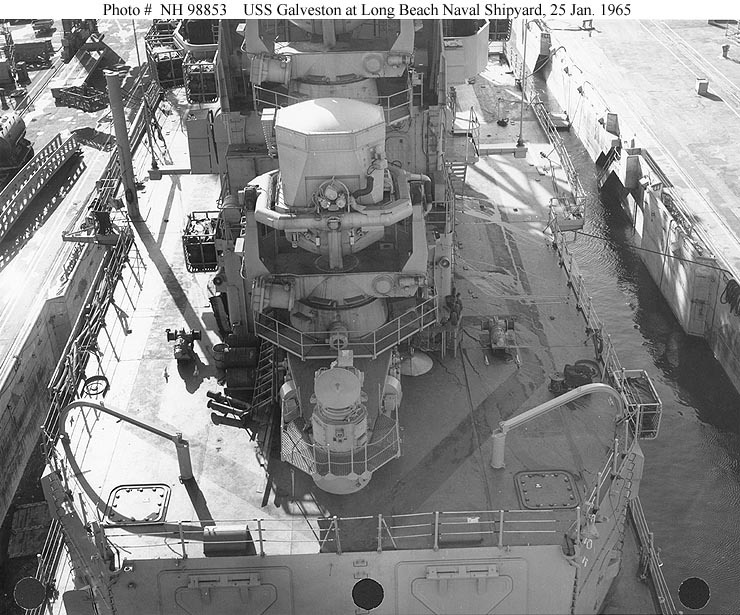 USS Galveston (CLG 3) View of the ship's afterdeck, taken while she was undergoing an inclining experiment at the Long Beach Naval Shipyard, California, 25 January 1965. 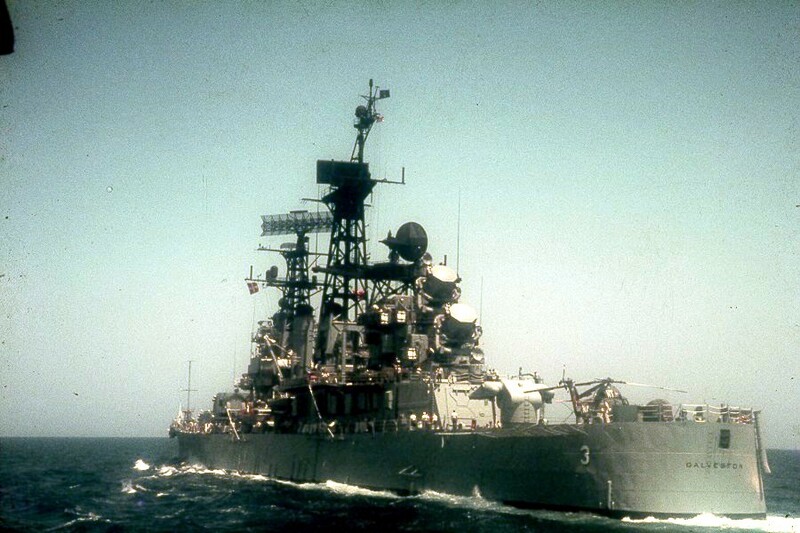 Athwartship track just aft of the "Talos" guided missile launcher is for shifting weights during the experiment. Official U.S. Navy Photograph, from the collections of the Naval Historical Center #NH 98855. 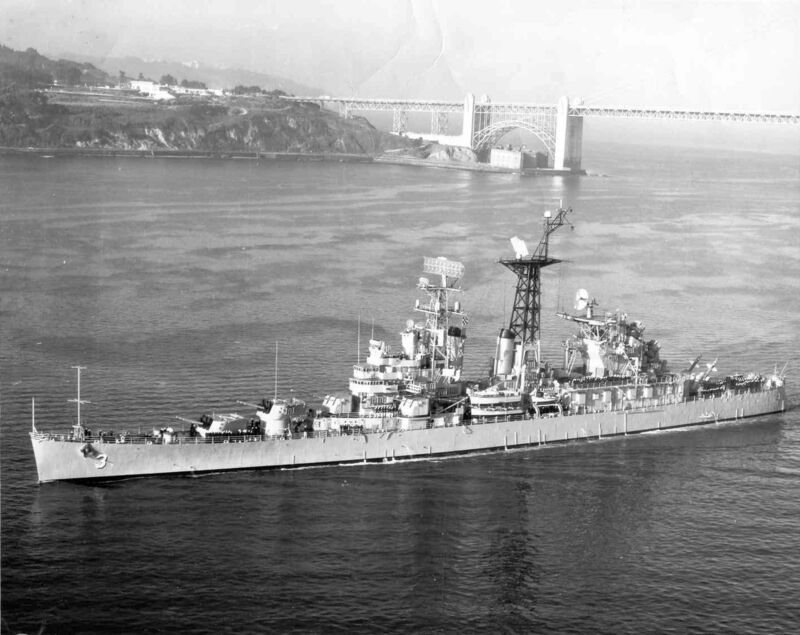 San Francisco, CA, 30 April 1965 - Starboard bow aerial view while entering San Francisco Bay. 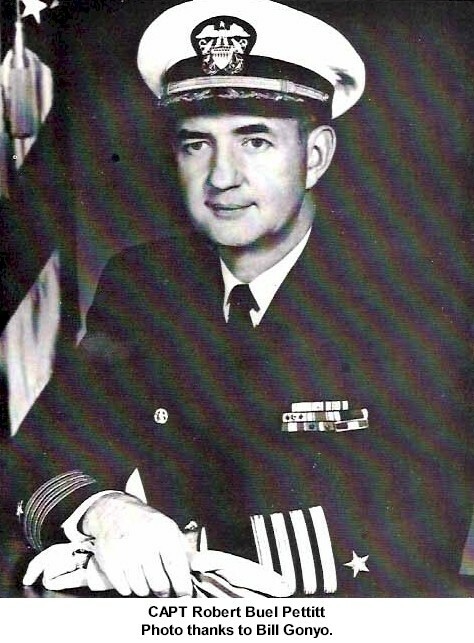 From the collection of CDR Thomas B. Ray. 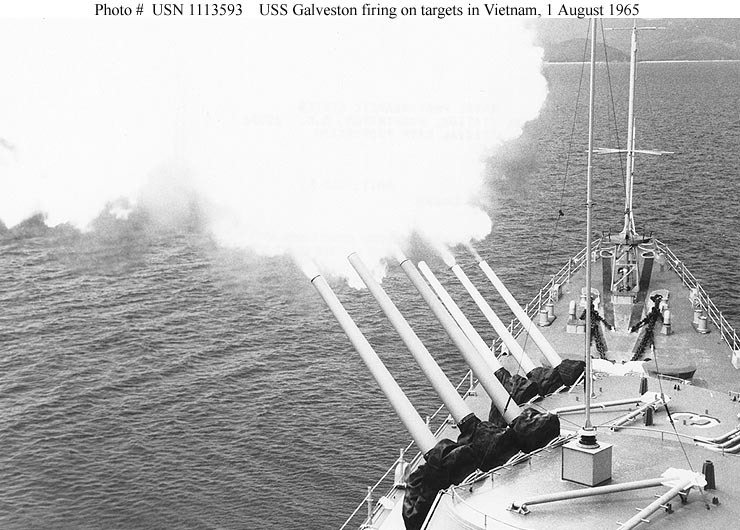 USS Galveston (CLG 3) Fires her 6"/47 guns at maximum range, during shore bombardment operations off Vietnam, 1 August 1965. Photographed by D.B. Jackson. 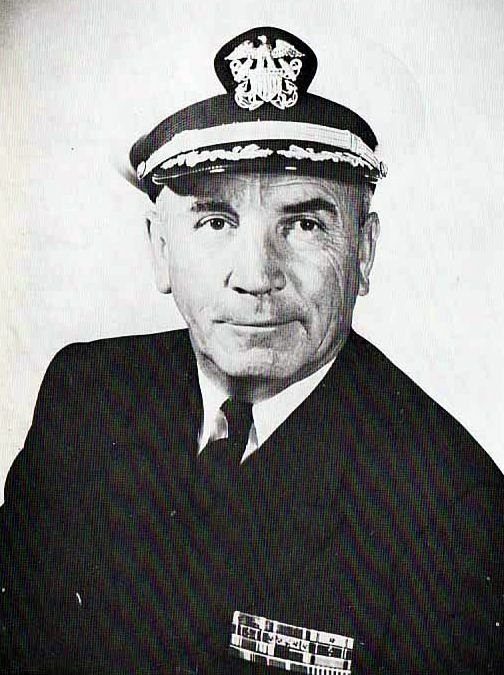 Official U.S. Navy Photograph #USN 1113593. 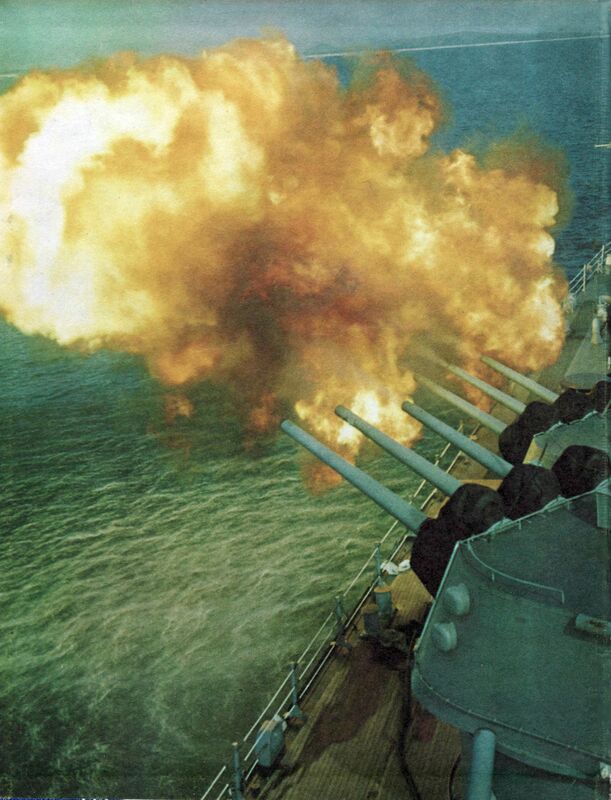 USS Galveston (CLG 3) Fires her 6"/47 guns off the south coast of Vietnam, during a dusk bombardment, 7 August 1965. Photographed by PH2 A.L. Wright. 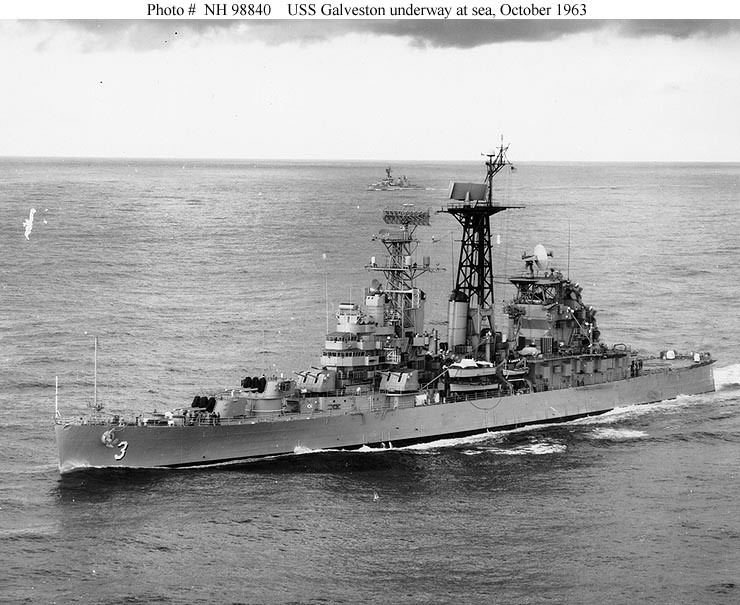 Official U.S. Navy Photograph, from the collections of the Naval Historical Center #NH 98847. 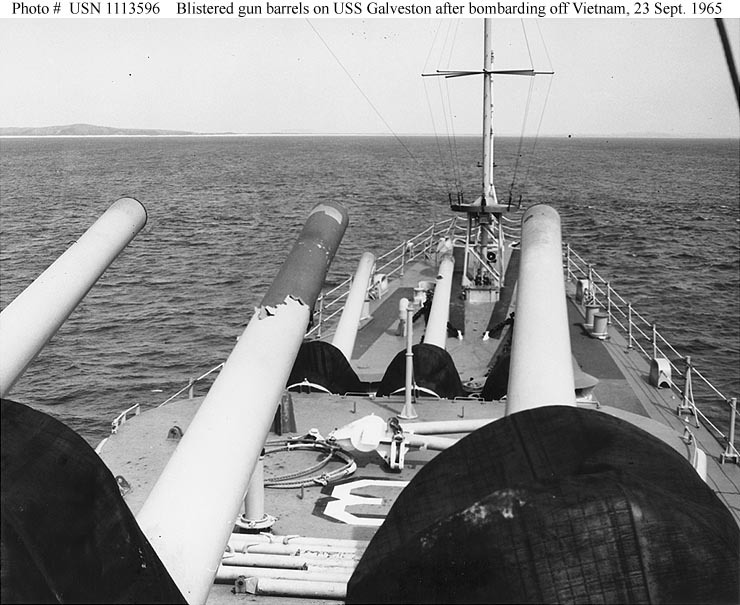 USS Galveston (CLG 3) Blistered paint on the barrels of the ship's 6"/47 guns after firing over 440 rounds of ammunition at Viet Cong targets in the I Corps area of South Vietnam, 23 September 1965. 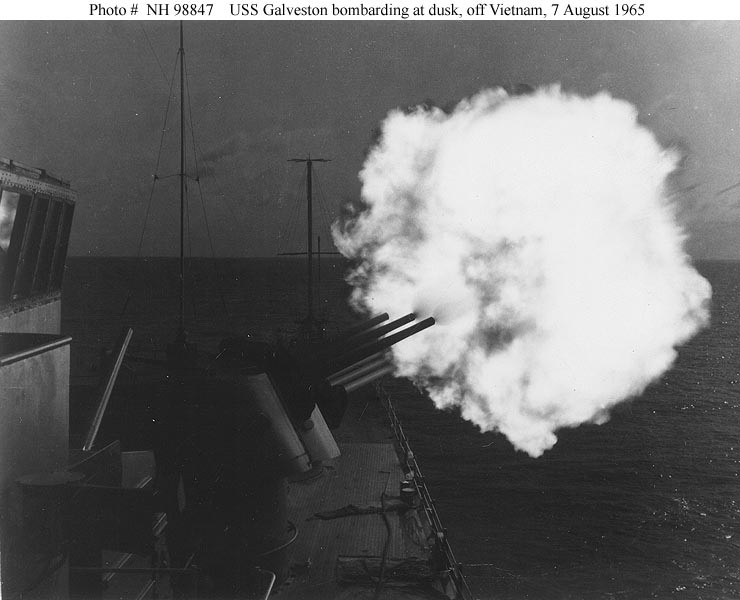 A spotter reported 13 Viet Cong killed in action during this bombardment, 50 structures and five guns destroyed. 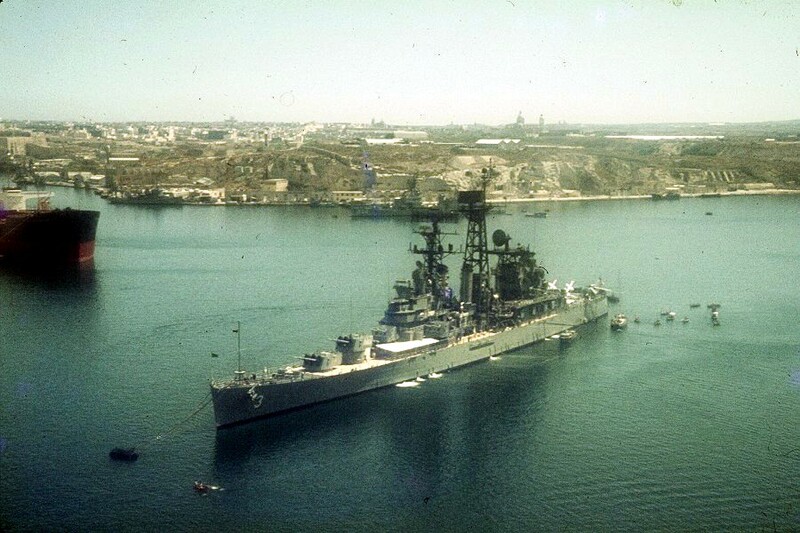 "Beautiful naval gunfire support", he commented. Photographed by Commander J.I. Moore. 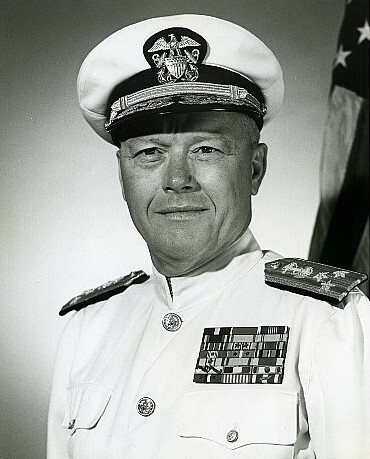 Official U.S. Navy Photograph #USN 1113596. 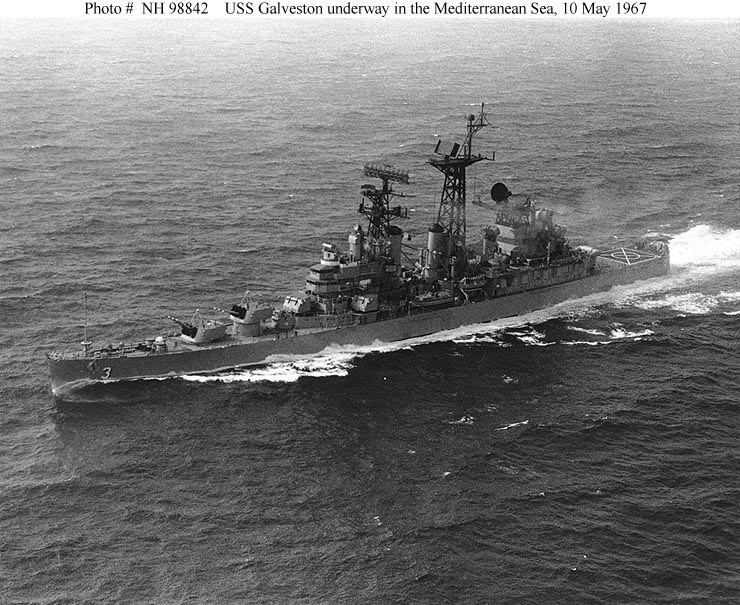 USS Galveston (CLG 3) Underway in the Mediterranean Sea, 10 May 1967. 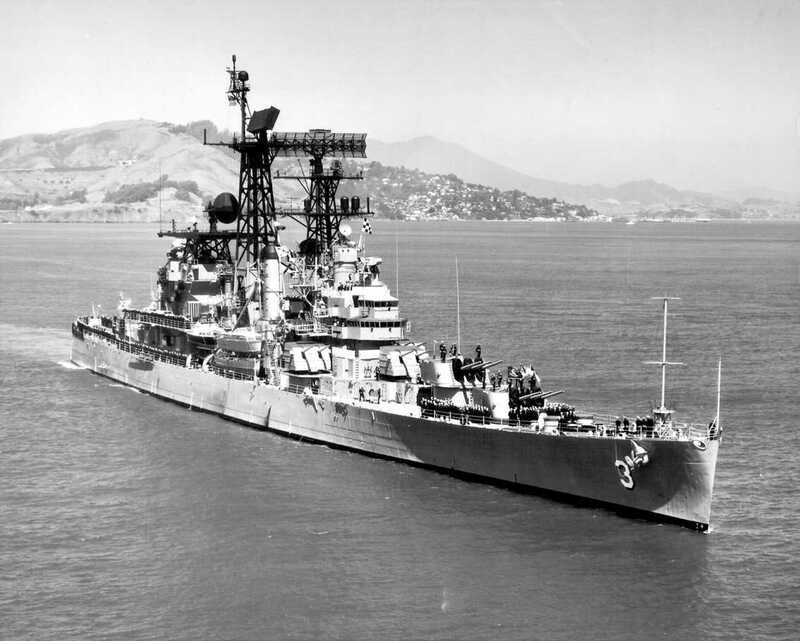 Official U.S. Navy Photograph, from the collections of the Naval Historical Center #NH 98842. 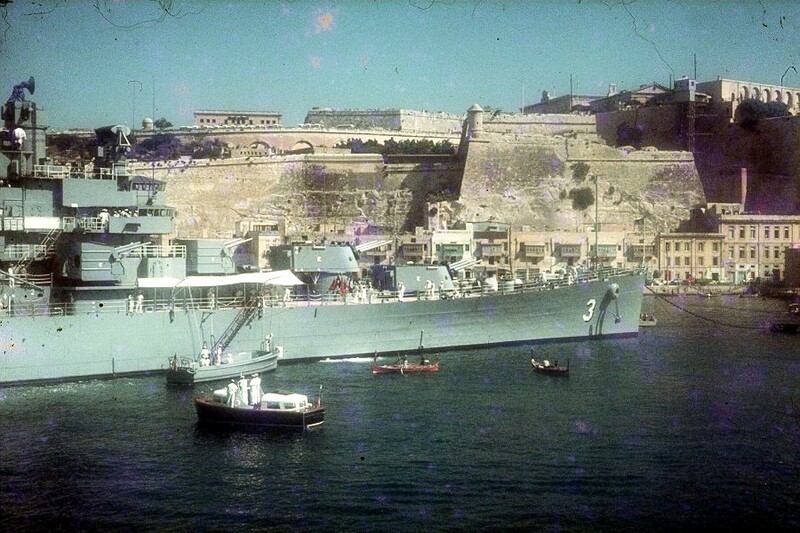 Valletta, Malta, 14 May 1967 - Port bow aerial view while anchored in the Bay of Grand Harbor. 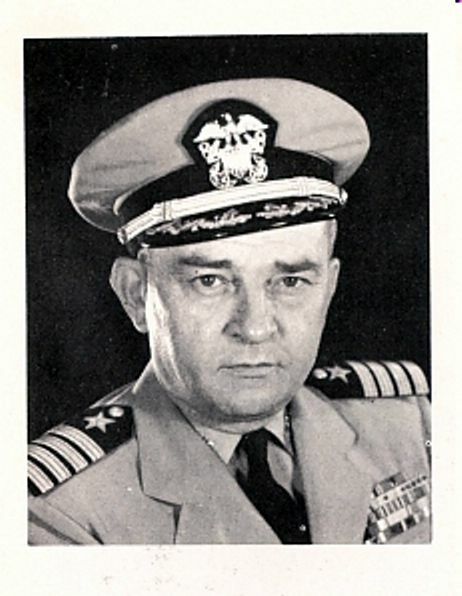 From the collection of CDR Thomas B. Ray. 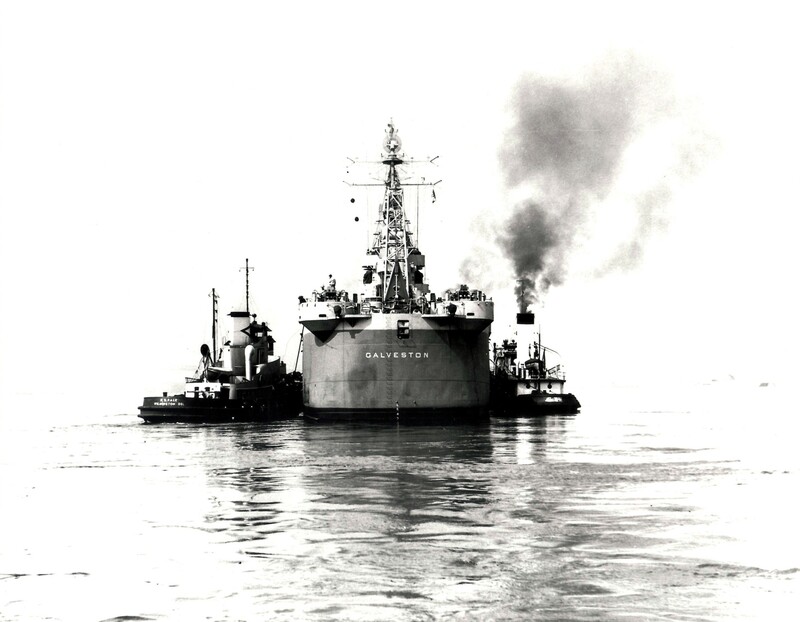 USS Galveston (CLG 3) Underway at sea, circa 1967. 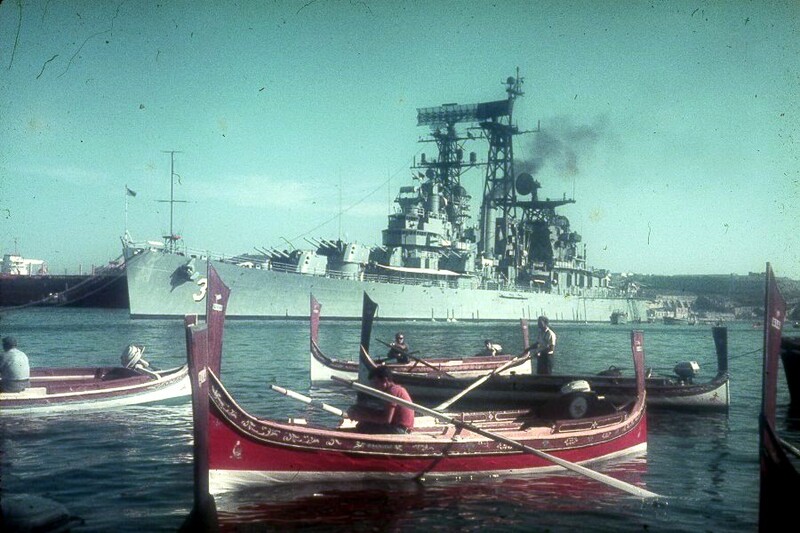 This photograph was received by the Naval Photographic Center in June 1967. 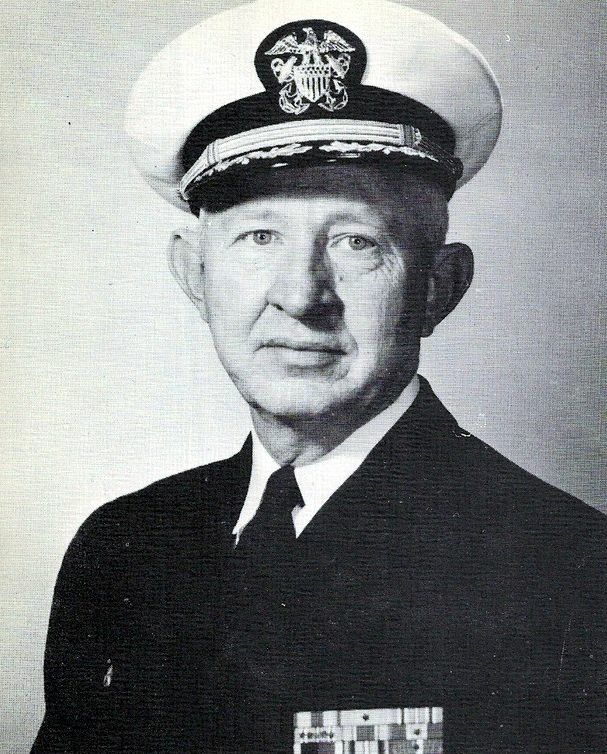 Official U.S. Navy Photograph, from the collections of the Naval Historical Center. #NH 98843. 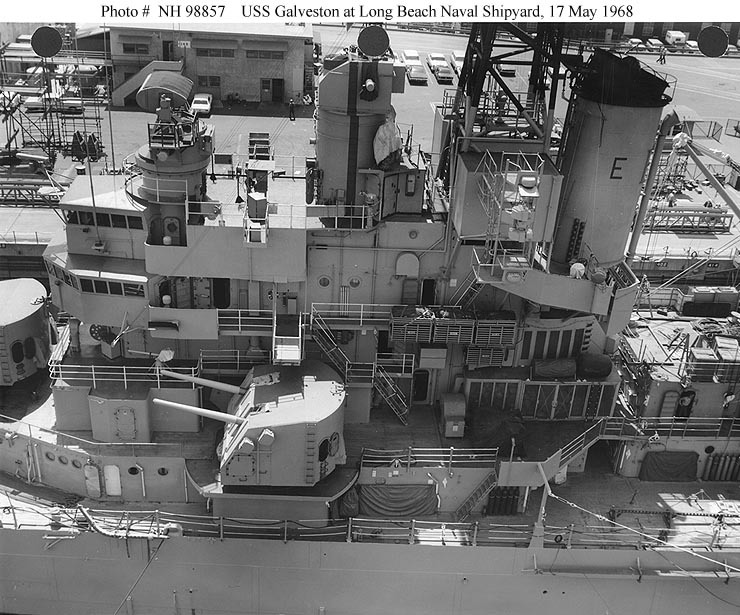 USS Galveston (CLG 3) View of the ship's forward superstructure, 5"/38 gun mounts and # 2 6"/47 gun turret, taken while she was undergoing an inclining experiment at the Long Beach Naval Shipyard, California, 17 May 1968. 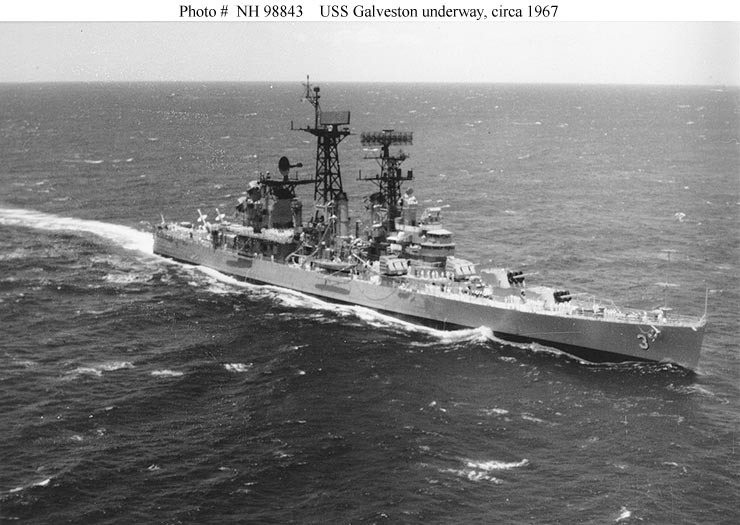 Official U.S. Navy Photograph, from the collections of the Naval Historical Center #NH 98856. 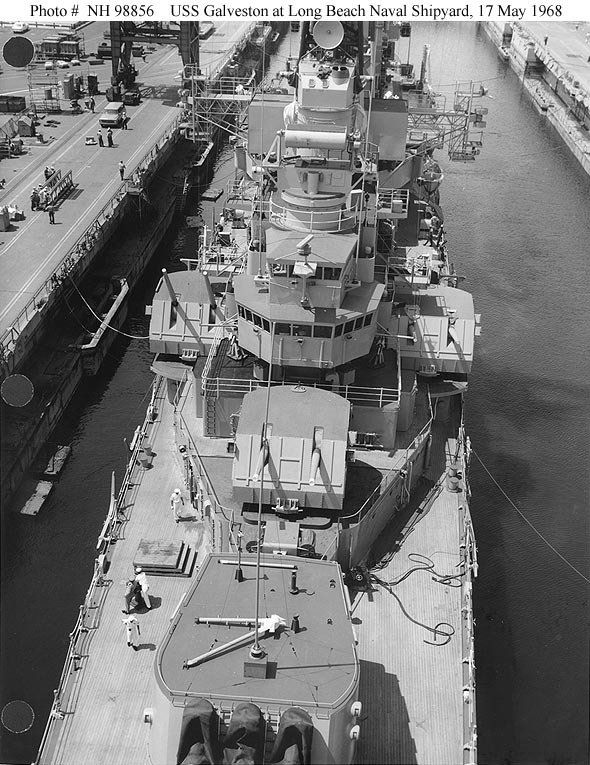 USS Galveston (CLG 3) View of the ship's forward superstructure and port side 5"/38 gun mount, taken while she was undergoing an inclining experiment at the Long Beach Naval Shipyard, California, 17 May 1968. 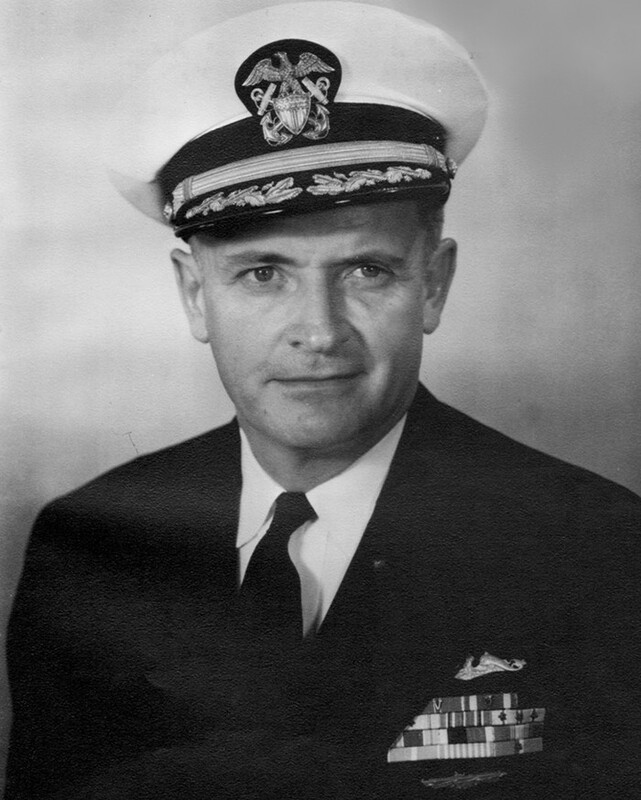 Official U.S. Navy Photograph, from the collections of the Naval Historical Center #NH 98857. 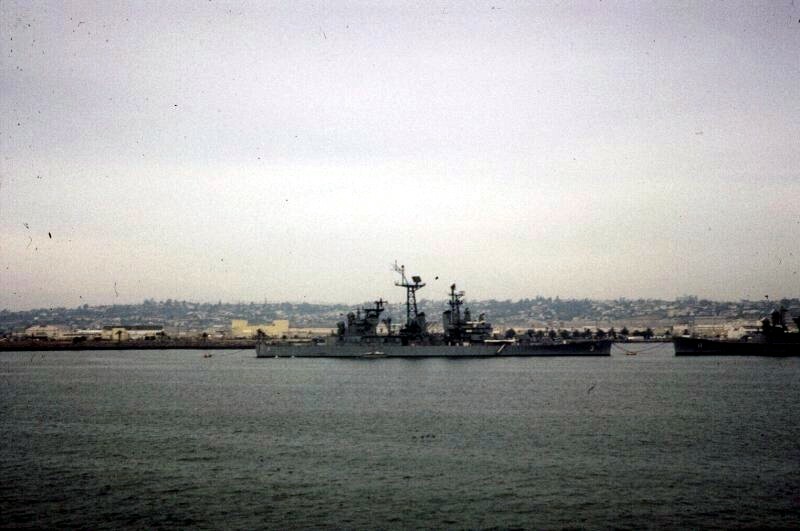 USS Galveston (CLG 3) View of the ship's midships area, taken while she was undergoing an inclining experiment at the Long Beach Naval Shipyard, California, 17 May 1968. Official U.S. Navy Photograph, from the collections of the Naval Historical Center #NH 98858. 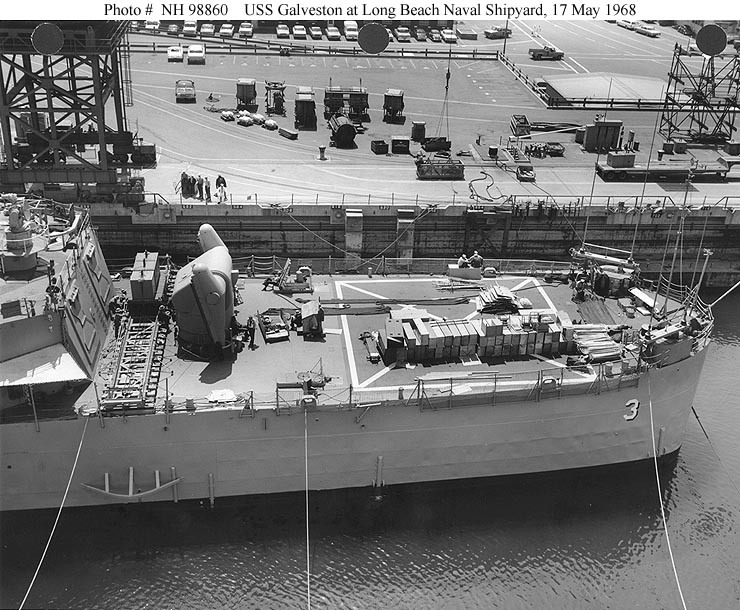 USS Galveston (CLG 3) View of the ship's after superstructure, showing underway replenishment gear, SPS-30 radar antenna and guidance radars for "Talos" guided missiles, taken while she was undergoing an inclining experiment at the Long Beach Naval Shipyard, California, 17 May 1968. 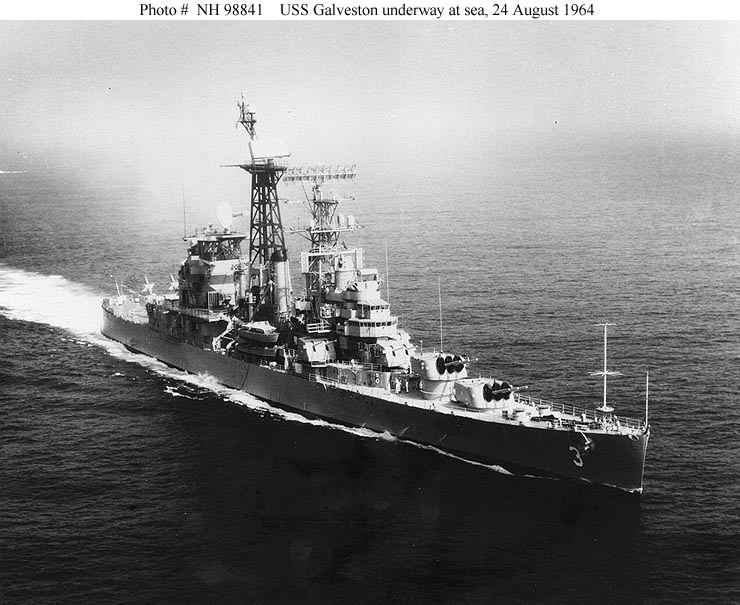 Official U.S. Navy Photograph, from the collections of the Naval Historical Center #NH 98859. 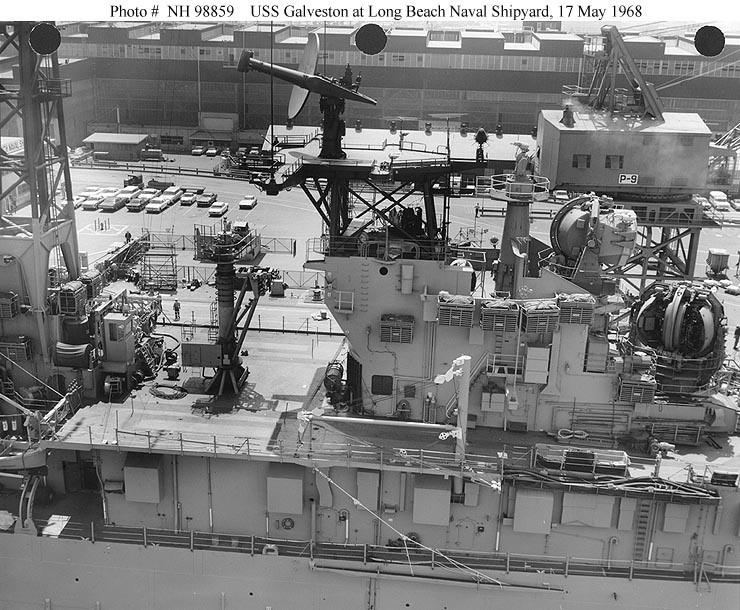 USS Galveston (CLG 3) View of the ship's afterdeck, showing launcher for "Talos" guided missiles, helicopter landing pad, and radio antennas, taken while she was undergoing an inclining experiment at the Long Beach Naval Shipyard, California, 17 May 1968. Athwartship track just forward of the missile launcher is for shifting weights during the experiment. 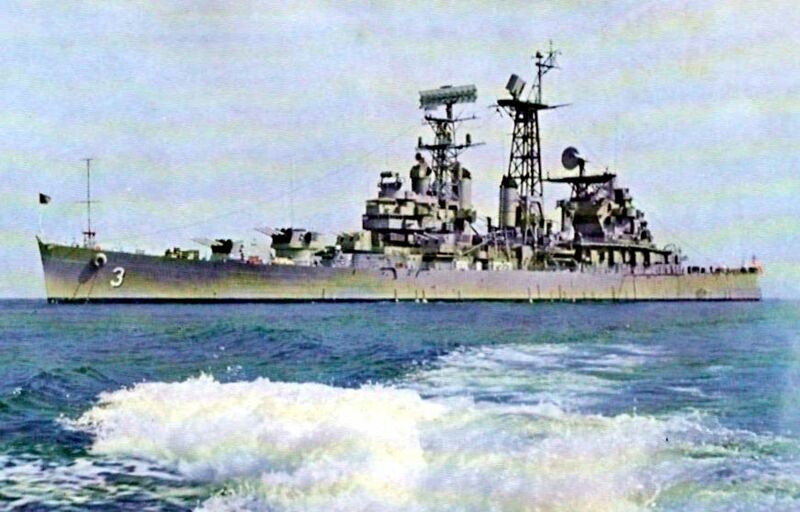 Official U.S. Navy Photograph, from the collections of the Naval Historical Center #NH 98860.